Your life together as a married couple should start with a wedding ceremony that is a true reflection of your values and style. Whether it is traditional, spiritual or secular it should be a representation of your culture and an expression of the love you share together. You should have the opportunity to provide input in the preparation of your ceremony and write your own vows if you so choose. 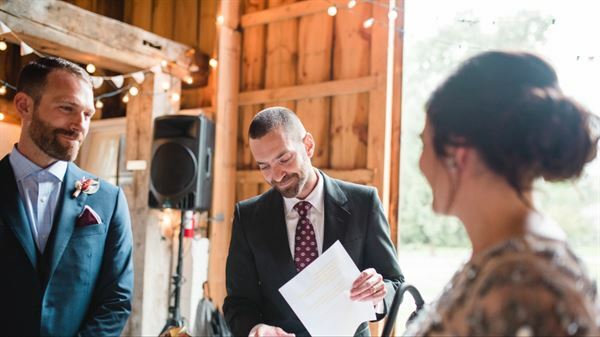 My role as a Wedding Officiant is to bring comfort to those in attendance and to join them in celebrating the love and commitment you have discovered in each other. Your wedding should be meaningful, respectful and memorable! Having always felt a strong connection to nature, I received a Bsc in Environmental Science. Shortly afterward, I became deeply interested in the connection between mind, body, and spirit. My studies of yoga and spirituality exposed me to Eastern culture and philosophy. This, as well as my personal experience as a husband and father of two young children, has served to diversify the awareness that I bring to my daily life, and to the ceremonies I perform. As a natural and well-practiced speaker, I am able to convey to everyone present the deep love and joy shared by the couple being married. -A customized ceremony based on your values and style. -Travel to and from your wedding venue, including my arriving 30 minutes before the time your wedding ceremony is scheduled. -The signing and filling out all of the necessary documents for you to be legally married within the province of Ontario, which I will then send to the Ontario government for registration. We hired Jonny Belinko to officiate our wedding and couldn't have been happier with the service he performed for us! The ceremony he prepared was beautiful, but he was open to edits and changes, even a few days before! He was responsive, helpful and delivered the service very well. Would recommend!